If you’ve been in Korea for longer than about five minutes, it’s highly likely that you’ll have come across some kimchi. The spicy fermented side dish, a staple of the typical Korean diet, comes in hundreds of different varieties and is served with almost everything. While it may be a shock to the system if you’ve never tried it before, kimchi is a food well worth learning to love – it’s loaded with probiotics, supporting healthy digestion, and its major ingredients include cruciferous vegetables and health-boosting foods such as garlic and ginger. It’s safe to say that, in Korea, people love their kimchi – in 2008, it even followed the first Korean astronaut, Yi So-yeon, into space, after an almost decade-long mission to invent Korean space food. In 2016, an estimated 1.85 million tons of kimchi were consumed in South Korea according to the World Institute of Kimchi. Kimchi is everywhere for the eating, but how many of us have tried our hand at making it? Since 2013, the act of making kimchi (known as kimjang) has been recognised as a UNESCO intangible cultural heritage asset. A slow and labour-intensive process, kimjang was once an activity that brought whole families and local communities together each winter, with the aim to make and share enough kimchi for everyone to eat until spring. These days the average Korean family is a little smaller, and hectic work schedules keep people busier than ever before. This means that, over time, fewer and fewer people go through the process of making kimchi together at home, opting instead to buy it. Enter the Seoul Kimchi Festival, or Kimjang Festival, which has taken place each November since 2014. Preserving the traditional culture of kimchi making in Korea since 2014, the festival sees thousands of people come together at Seoul Plaza to celebrate the spicy national dish – collectively making large quantities of kimchi to donate to people in need. The festival is a fantastic opportunity for people to help out their local communities, for young people to learn from older generations, and for foreigners to get hands-on experience with this uniquely Korean process. The kimchi donation program runs for three days between Friday and Sunday, during which time visitors can take part in a multitude of additional activities. There are kimjang classes specifically tailored to foreign visitors, as well as demonstrations and performances providing entertainment during the festival. Visitors can learn more about kimchi through educational exhibits, while a kimchi-themed playground is provided for children to enjoy – and, of course, all are encouraged to get a taste of this spicy superfood in a variety of forms at the Kimchi Market. 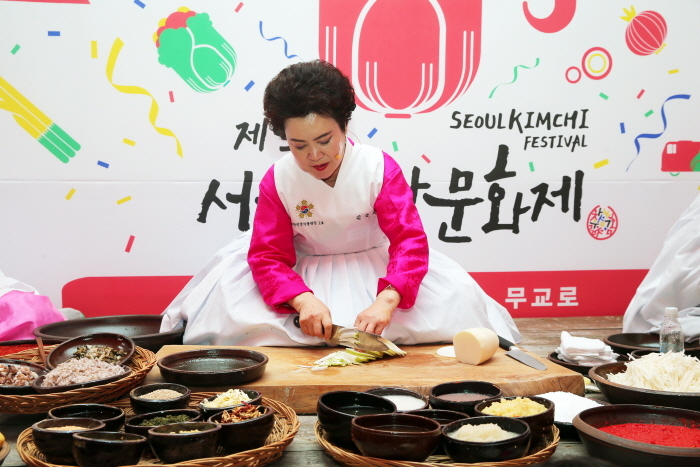 If you’ve ever found yourself curious about the process of making kimchi and have wanted to give it a go, the Seoul Kimchi Festival would be an excellent place to start. It is a perfect example of the warm, sharing spirit of Korea that, once experienced, is difficult to forget.